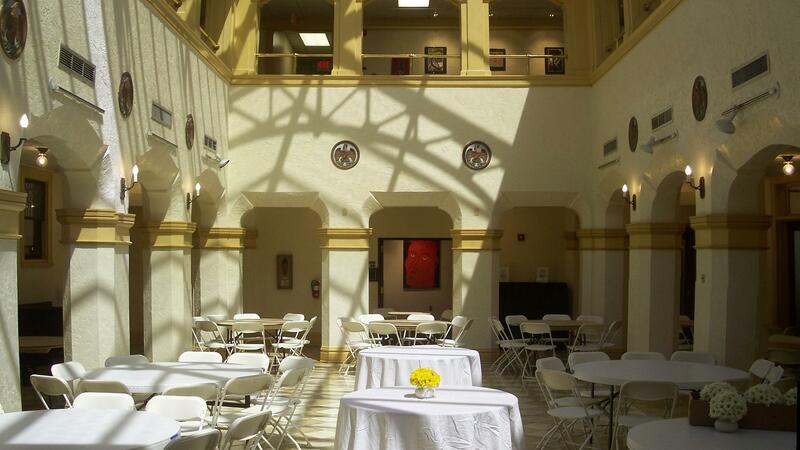 Rent The Thomas Center | Corporate Events | Wedding Locations, Event Spaces and Party Venues. The historic Thomas Center has consistently been voted one of the best wedding venues in Gainesville for many years. Come see why dozens of couples select us every year to host the most important day of their lives. The west veranda is the perfect introduction to the Thomas Center before your guests are ushered graciously inside. There too, you can impress your out-of-town visitors with cocktails overlooking lush southern gardens, original fountain and rose, camellia and azalea plantings. The Spanish Court, situated at the heart of the Thomas Center, rises two-stories to a full skylight. It is surrounded by a colonnade and second story Mezzanine area. Your guests will talk for years to come about the time they danced the night away under the stars in this enchanting space.